diagram is computed by Fortune's voronoi programm. Output is rendered by XML template engine which can be customized for your needs. 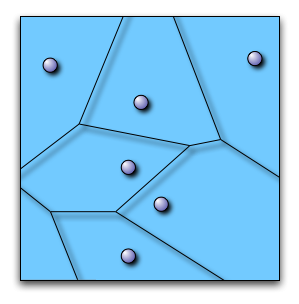 This application displays Voronoi diagrams and Delauny triangulations. It uses Fortune's voronoi program to compute the Voronoi diagram. The application consumes your sites and produces PDF. Just google or take a look at voronoi.com. 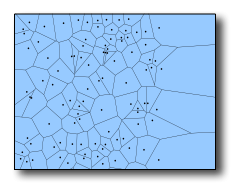 You will find many documentation about Voronoi diagrams. The output is your specified paper. If you choose A4 for papersize the Voronoi diagram is rendered on 20,90 cm x 29,70 cm. For best results place the sites within the output page. You can also use units like "cm", "pt", "inch" or "mm". The default unit is point. Sometimes the sites do not fit on the paper. They need scaling and translating to make them fit. You can specify a scaling factor and offset value for x and y coordinates. Now the coordinates of every site will be scaled by 600. The x coordinate will be translate by 12 points and the y coordinate by 24 points. Output is driven by a template engine. Three templates are built-in. 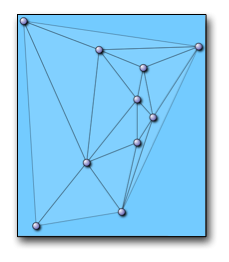 In the same way that a planar graph has its dual graph, a Voronoi diagram has its dual tessellation, called a Delaunay triangulation.